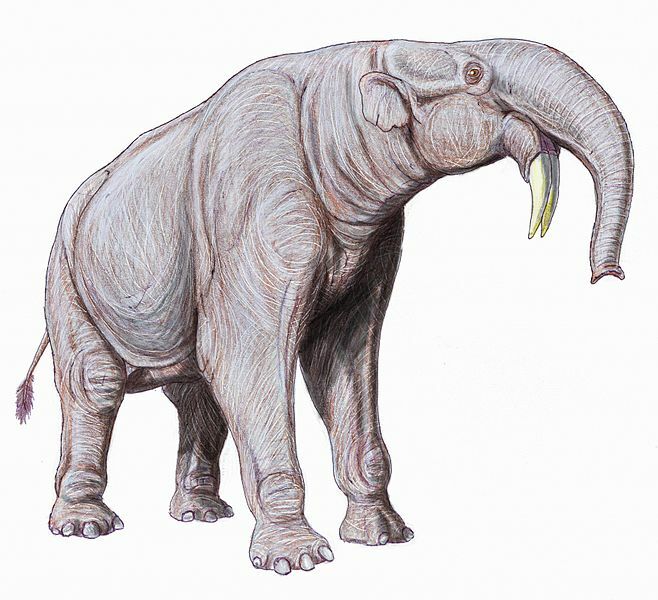 As you can tell from the picture for this article, this elephant, known as Deinotherium, had tusks that were in a very odd arrangement . . . backwards. However, maybe today’s elephants are backwards and Deinotherium is the one with them pointing the right way. Whose to decide? Anyway, because these tusks are placed in such a peculiar way scientists believe that the elephant would/could use the tusks to dig up roots or plants and then grasp them with the trunk. Other theories state the tusks were used to strip bark from trees. Or maybe they were used to break down branches so Deinotherium could get easier access to the branches. The battle about how they were used can only truly be answered when we finally meet one of these amazing creatures.